You can go to your local bookstore and buy the books, of course. You know, those things that used to be trees? You can also order them through Amazon.com, Barnesandnoble.com, and the HBO store, among other online sources. But do you need that fix RIGHT NOW? Amazon will sell you all five books in ebook format, delivered instantaneously to your Kindle. And so will BarnesandNoble.com if you own a Nook. The itunes store will sell them to you, too, delivered through your ibooks app, and they’ll sell you the audiobooks, as well (Amazon,too). You can also download podcasts from itunes featuring the series author, George R. R. Martin, discussing the books and the HBO series, if that’s not enough for you. If you go to HBO.com, you can order not only the books but the dvds for the first two seasons and a ton of GoT swag: teeshirts, shot glasses, coasters, you name it. If you want to obsessively re-watch the first two seasons, or catch up if you’re coming late to the party, and you want to do it right this very minute, you can use a feature called HBOGo on your ipad or xbox. I myself have already read all the books and seen all the shows. What do I want now? What do I want RIGHT NOW? My own working model of that cool map that starts each episode. Or maybe. 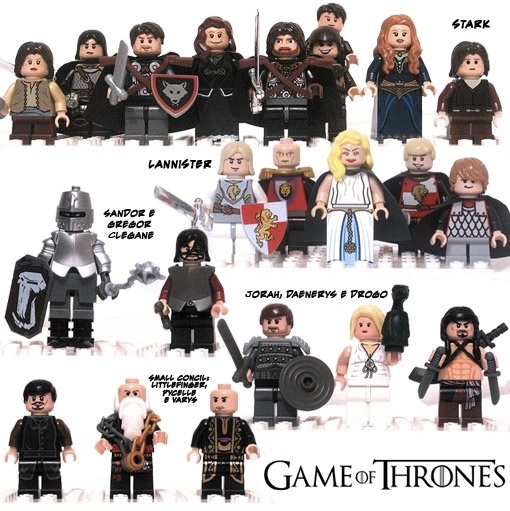 . . how about the total cast of the books/shows, created in Legos? Game of Thrones fans: Only 225 days to go! blogs to read content, however this weblog offers quality based articles.